Dewsbury Moor recorded an impressive 26-22 victory away to Stanningley in the first game in National Conference League Division Two following last season's promotion. Picture: Stevan Morton. Dewsbury Moor Maroons began their National Conference League Division Two campaign with a superb 26-22 victory away to much fancied Stanningley last Saturday. The pitch had been covered all week and the hosts did an excellent job of ensuring the game was on. 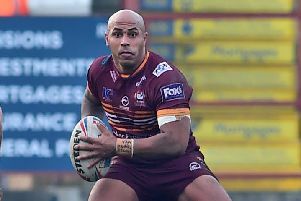 After defending early back-to-back sets, Moor launched an attack as stand off Tom Kaye fed centre AJ Boardman, who sent winger Jacob Flathers racing down the touchline. As the full-back approached, Flathers slipped the ball back inside for Boardman to score and he stepped inside to give Aiden Ineson an easier conversion, which he duly kicked. Stanningley responded as a missed tackle and some great support play allowed them to score between the posts and when Moor conceded cheap penalties, the home side scored again to lead 12-6. Kaye, Boardman and Flathers pressed but the final pass from Boardman was intercepted by the Stanningley winger, who raced 90 metres to score and Moor now faced a huge task trailing 16-6. Moor forwards Archie Bruce, Brad Foster, Cameron Bruce, Dom Horn, Toby Richardson and Jamie Samme put some big hits in as they finally started to get a foothold in the game. Moor pressed but against the run of play, Stanningley broke away to score again. Moor’s 15-match winning streak was under serious threat but they showed real character to fight back superbly. A neat kick behind the defence by Aiden Ineson saw winger Sam Thornton out strip the defence to collect the ball and score out wide. Ineson failed with the conversion and Moor trailed 22-10 at half-time. Coach James Delaney rallied his troops during the interval and Moor came out firing. Flathers intercepted a pass and raced 80 metres to score. Ineson converted and the comeback was on. Great play by Samme saw the ball slipped to Ineson, who found Luke Adamson with a smart pass and the centre evaded defenders to score out wide. A storming run by Tom Harrington burst the defence, the Stanningley full-back made a brave tackle but a penalty from the play of the ball was converted by man-of-the-match Ineson as Moor drew level at 22-22. Kaye, Boardman and Flathers combined with the latter spotting a gap and used great strength to force is way over in the corner. Ineson couldn’t convert but the visitors were finally in front. The final minutes were tense but it was Moor’s renewed enthusiasm that saw the game out and when the final whistle blew the players were ecstatic. Moor’s first team face Drighlington in their opening Division Two home game on Saturday (kick off 2.30pm), while the young alliance team travel to Normanton in the Yorkshire Men’s League Forty20 Cup.